Springfield, MO. (September 1, 2016) - The Springfield Art Museum is pleased to announce the return of the biennial Four by Four: 2016 Midwest Invitational Exhibition. This exhibition recognizes and encourages artists working in all media who reside in the four-state region of Missouri, Oklahoma, Arkansas and Kansas. The exhibit features a body of work by four artists – one from each state. This year's exhibition will include work by Andrew Casto (Kansas), Sandra Luckett (Arkansas), Anne Austin Pearce (Missouri), and Holly Wilson (Oklahoma). This focused exhibition provides an in-depth study of each artist’s work, and a deep, rich conversation about their connection to the region and the placement of their work in the larger context of contemporary art. A juror of awards is selected on a rotating basis from one of the four states – this year’s juror is Kelly Schindler, Associate Curator at the Contemporary Art Museum St. Louis. Schindler is tasked with awarding a $3,000 cash prize to one artist for their body of work. This award is meant to propel an artist’s studio practice, providing funds for equipment, study, travel, or other needs that will help them in their career. 2014’s award winner, Missouri’s own Sage Dawson, used the funds to purchase and refurbish a printing press which has revolutionized her practice, and those of artists in her St. Louis community who frequently utilize Dawson’s press. This year’s award will be announced at the exhibition’s opening reception on Friday, September 9, 2016 from 5:30 to 7 PM at the Springfield Art Museum. This event is free and open to the public. 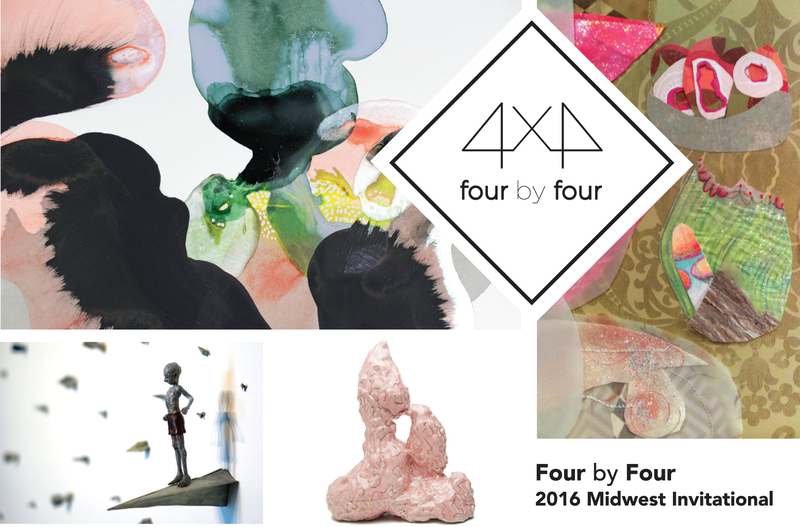 The Four by Four: 2016 Midwest Invitational Exhibition features a range of media from painting, ceramics and sculpture, to a mixed media, site-specific installation. Andrew Casto's ceramic sculptures are based on a material study of erosion and geological processes. Sandra Luckett creates playful, ephemeral installations and sculptures that transform mundane materials such as paper, sequins, silk flowers, and fabric into fantastical environments. Luckett was recently named an "Artist to Watch" by the National Museum for Women in the Arts. Anne Austin Pearce's large scale watercolor paintings illustrate ambiguous moments that occur in one’s head, or between two people at the intersection of communication. Holly Wilson’s figurative works serve as sacred and precious storytellers. Wilson recently received the prestigious 2015 Eiteljorg Fellowship from the Eiteljorg Museum of American Indians & Western Art in Indianapolis. Curator of Art Sarah Buhr notes, “The invited artists all tackle the theme of investigating and attempting to articulate ‘in-between spaces,’ those things at the razor’s edge of our perception, the hard to grasp. Their work is united in the use of highly textured surfaces, deep, luscious color, and pattern and decoration. However, their use of media and the stories they tell are as disparate as the region they represent.” Buhr was recently awarded the Association of Midwest Museum’s Promising Leadership Award, in part due to her advocacy of the best in emerging and under-recognized contemporary artists in the Midwest through the Four by Four: Midwest Invitational Exhibition. See the Four by Four: 2016 Midwest Invitational Exhibition from September 10 through December 4, 2016 at the Springfield Art Museum, located at 1111 E. Brookside Drive in Springfield, Missouri. Admission is always free. Additional exhibition information and images. ⇐Previous Jerry Hoover and the Firehouse Band Kicks-Off New First Friday Concert SeriesNext⇒ Springfield Art Museum and Drury University to de-install House of Art(S).